Samaritan’s Purse is helping Nebraska recover after unprecedented flooding. 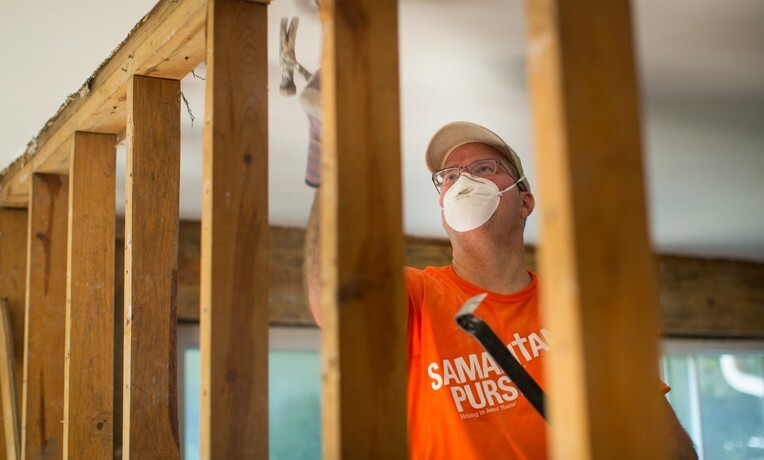 Samaritan’s Purse volunteers have been busy in Nebraska since March 22 assisting communities after catastrophic flooding struck the Midwest. We have been helping dozens of homeowners remove debris and damaged belongings and offering encouragement in Jesus’ Name. Among these homeowners are long-time Operation Christmas Child volunteers Charlotte Young and her husband Ron. The flood-weary couple has been serving with our Operation Christmas Child project for the past two decades helping to provide gifts to children in need all around the world. In their own home town, though, they found themselves on the receiving end of a Samaritan’s Purse gift at their flooded property last week. Our volunteer teams are braving the cold and the deep mud to help Nebraska homeowners Ron and Charlotte Young, longtime Operation Christmas Child volunteers. Our volunteers mudded-out their family residence of 35 years where several feet of water destroyed drywall and violently shifted their belongings. “It was like a tornado inside a house,” Ron said. Included in those possessions were years of Operation Christmas Child packing photos as well as items that Charlotte planned to pack in shoeboxes for the 2019 collection season. “I never dreamed that I would ever call Samaritan’s Purse [for help],” Charlotte said. “I never had any idea that it would happen.” Still, the couple thanked God for sending Samaritan’s Purse to them. “People coming in orange shirts—this is my first day to feel relieved,” she said. After they received a Billy Graham Study Bible signed by the volunteers who worked on their home, the couple smiled through tears. We’ve been encouraged to see how God has used the work of Samaritan’s Purse to be a connecting point for family members—even 1,600 miles apart. Volunteers have to carry away debris and ruined belongings from flooded Nebraska homes. When we responded last week to the historic flooding, we met volunteer Nancy Lichtenberg. Nancy attends Fremont Alliance Church—our base of operations in Fremont, Nebraska. She also happens to be the niece of a California homeowner, Elaine, who we helped late last year. Elaine tragically lost her Paradise, California, home in the devastating Camp Fire that destroyed 13,000 homes and claimed 85 lives. Samaritan’s Purse helped her find her late husband’s wedding ring—a priceless item she was saving for her only grandson—amid the ashes of her destroyed home. Elaine was one of 1,200 homeowners Samaritan’s Purse helped during the Camp Fire response. When it was announced that we would be coming to Fremont, Nancy said she wanted to be a part of helping her community through the organization who had helped her aunt so much. “When I heard Samaritan’s Purse was coming here, I thought, ‘I have to give back for what they did for my aunt.’ [My aunt] said that the Samaritan’s Purse people were just such a blessing to them,” she said. We presented homeowner Dewayne Docken with a special Bible signed by the volunteers who worked at his home. A previous brain surgery and additional physical ailments keep Nancy from going out into the field to work with volunteer teams, but she still felt the Lord calling her to serve her community. “Most of my life, I’ve had receptionist jobs. So, I said, ‘I can answer a phone,’” she recalled, chuckling. While the unprecedented flooding did not affect their home, Nancy and her husband Jim were trapped for several days by the extensive damage it caused. And their son, Chris, experienced the extent of the flooding while working as a first responder. Chris and six fellow firefighters ventured across the floodwaters in airboats, helping rescue families from their homes. In the dark of night, the boats sank—overcome by the rising water and cold wind. “There were seven firefighters standing in chest-high icy water,” Nancy said. “They didn’t know if anyone was coming to rescue them—these guys were trying to formulate a plan on how they could rescue themselves.” Thankfully, the National Guard came to their rescue. Mudouts are a messy job for our volunteers serving in the flooded midwest, but they are an immense blessing to so many as we help in Jesus’ Name. Nancy thanks God for sending Samaritan’s Purse to the rescue in Nebraska much like He sent the National Guard to rescue her son. “I have felt so blessed working because everyone from Samaritan’s Purse’s focus is to do what God requires them to do. It is to show people God’s love first of all—and that’s where the long-term impact is going to be,” Nancy said. As Samaritan’s Purse continues to respond to devastating flooding in eastern Nebraska, please continue to pray for these affected families and for our team of volunteers serving in Jesus’ Name.